6-month-old Naidhruva is suffering from a severe liver disease for which the only treatment is a liver transplant. 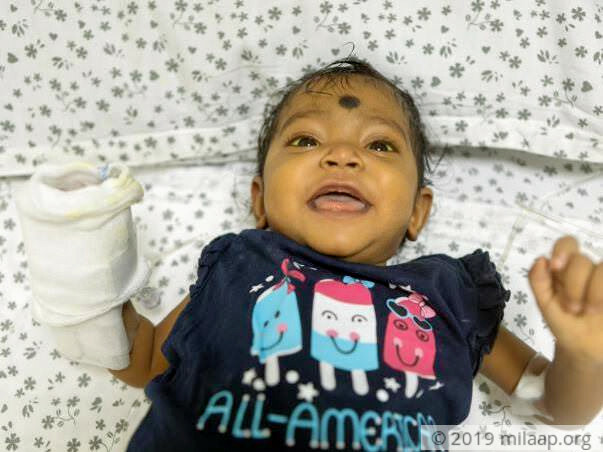 Unfortunately, Naidhruva's parents have exhausted their funds in paying for her medical expenses so far and need our help to afford the treatment and save their daughter. Your contribution can give Naidhruva the treatment she deserves. Thanks for your support. Naidhruva Shree Is recovering well and Medication also reduced. We are going to doctor for regular checkups. Thanks to entire Milaap, the hospital team, the donors and the well wishers for supporting me. 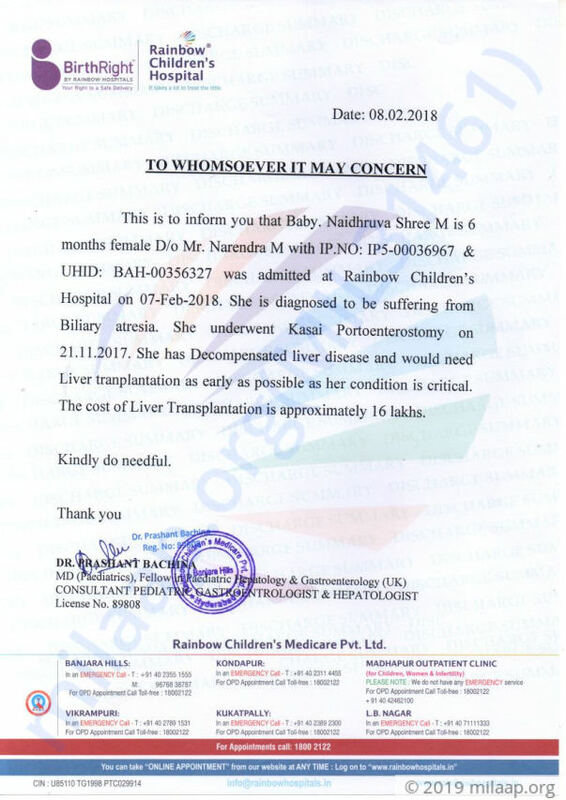 My daughter Naidhruva Shree had liver transplant surgery on 28th Feb 2018. Now we are going for regular checkups to Global Hospital Team and Rainbow Hospital Team. Half of the medication has also been reduced. Both recipient - Naidhruva Shree (daughter) and donor - Sravanthi (mother) are all good. Recently 28th July, Saturday we have celebrated Naidhruva Shree 1st Birthday. Thank you for the wonderful support and love that you have shown towards my daughter and my family. We would not have been here today if not for all your support. Here is an update on Naidhruva's health. Currently, the baby is at home and doing fine. There had not been any major post-surgery complications. We have to visit the hospital every ten days for the follow-ups and tests as prescribed by the doctors. She is on regular medication and is showing signs of improvement. We would like to thank all of you for the love and support you have shown.